Joliet, Illinois is a booming sprawlburg located about 40 miles southwest of downtown Chicago with a current estimated population of nearly 150,000 residents. In its long history, Joliet has worn a lot of hats, from industrial-era superpower to beleagured rust-belt city and back to a different kind of economic success supporting the great machine of Chicagoland. In fact, Joliet has doubled in population since 1990 and is considered the fastest growing city over 100,000 in the midwest. Whereas just a few decades ago Joliet was considered distinctly separate from Chicago, today the suburban areas between the cities are completely filled in and Joliet functions as a bedroom community for the suburban mass-at-large, as well as behaving as an anchor city containing many support activities and jobs for a metropolitan area of almost ten million people. In the 1960s and 1970s, however, Joliet’s plight was a bit different, as it was then considered both farther and further from Chicago, physically as well as ideologically. Also, the rust-belt problems which ensued across the entire midwest and northeast hit Joliet pretty hard, as many of the city’s enormous factories closed or scaled back operations dramatically as the nation moved from a manufacturing to service economy. 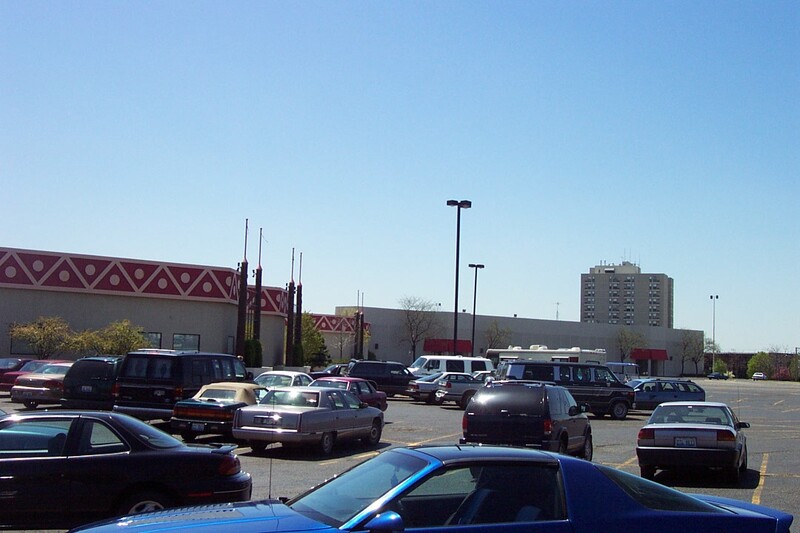 Even so, developers recognized the city’s need for adequate shopping, being a rather large distance from other large shopping malls in Chicagoland. 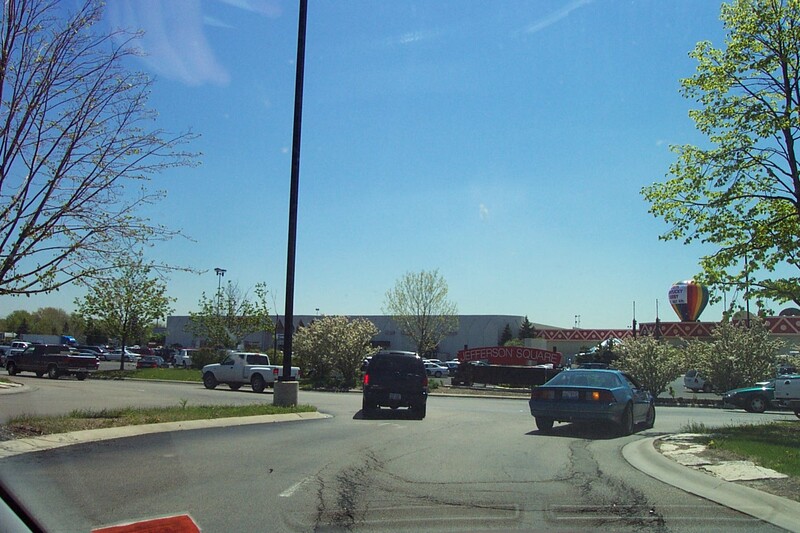 As such, the first retail mall constructed in Joliet (actually neighboring Crest Hill) was Hillcrest Shopping Center along the Larkin Street (Route 7) retail corridor. Opened in 1959, this outdoor mall was anchored by Chicago-based Goldblatt’s and Joliet-based Boston Store (no affiliation with the current Boston Store chain owned by Bon-Ton). This popular outdoor center soldiered on until 1975 when a larger, more modern enclosed mall opened along West Jefferson (Route 52) just west of Larkin: Jefferson Square Mall. Anchored by Wieboldt’s and Montgomery Ward with both Woolworth’s and Walgreens as junior anchors, Jefferson Square quickly gained popularity as Hillcrest faded. The Boston Store, which was going broke citing competition from all the larger regional retailers and discount boxes which were emerging, closed its downtown branch in 1972 and the Hillcrest Location by 1977. Goldblatt’s, a Chicago institution and the other anchor at Hillcrest, was the next to go following an unsuccessful round of competition with other Chicago-area stores, and closed in 1982. Meanwhile, an even larger and even more modern behemoth, Louis Joliet Mall, opened on what was then the edge of Joliet and almost to Plainfield at the intersection of Route 30 and I-55 in 1978, expanding through 1979. In all ways, Louis Joliet Mall was the category killer of its time. Not only did it have interstate access, it was more easily accessible from the fast-growing communities of Romeoville, Plainfield and Bolingbrook to the north, as well as from all points along I-55 southward and I-80 westward. Also, Louis Joliet had a more impressive roster of stores, with Bergner’s, Sears, JCPenney, and Marshall Fields, and was more in line with a demographic recipe for continued success. Unfortunately, just as things were looking up for both Jefferson Square and Louis Joliet Malls, they were taking a turn for the worse at Hillcrest. In the mid-1970s, a Service Merchandise replaced the old Boston Store location, and in 1984, Venture came to rescue the space vacated by Goldblatt’s. In 1986, Service Merchandise closed and briefly became a Highland electronics store and a Discovery Zone; today the site has been subdivided into smaller stores. Venture lasted until 1998 when it became Ames for less than a year from 2000 to 2001, and ironically briefly turned back into Goldblatt’s before closing again to be subdivided into smaller stores including a Food4Less grocery store. It seems Hillcrest, despite its ups and downs, has withstood the test of time by constantly reinventing its purpose, from super-regional draw in 1959 to the everyday melange of stores which makes up a traditional suburban strip mall. A few miles away at Jefferson Square, the mall soldiered on successful a bit longer; however, Louis Joliet’s dominance in location and stores continued to slowly eat away at Jefferson Square’s base. Jefferson Square was only convenient to central Joliet, whereas Louis Joliet became closer to the expanding communities of Romeoville and Plainfield, and also the booming part of Joliet. A large retail strip developed around Louis Joliet, whereas the established retail strip around Jefferson Square was not as complete with category killers and modern big box giants. The first major blow to Jefferson Square was the closure of Wieboldts in 1987. 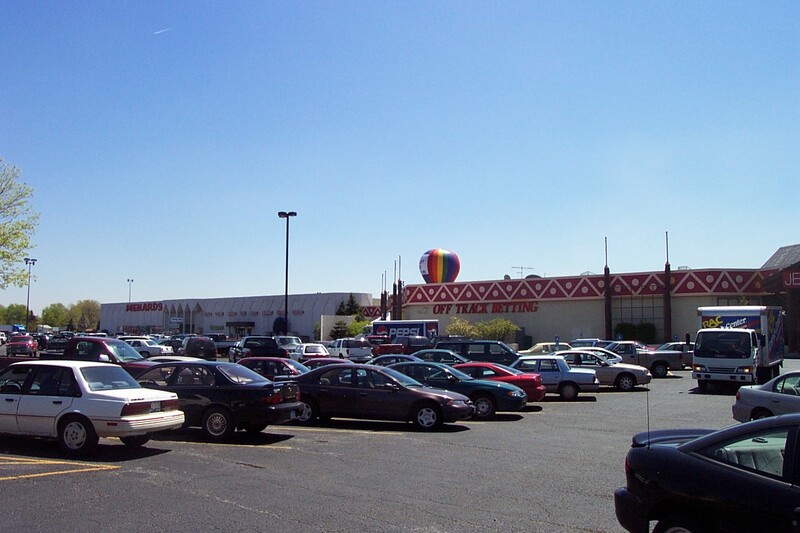 Up until this point, Jefferson Square had many of the in-line stores Louis Joliet had, and effectively served the population of central Joliet better in this fashion. However, once Wieboldt’s closed, Jefferson Square quickly began a downward spiral from which it could never emerge, despite several life-saving attempts. In 1991, Menards, a midwest-based home improvement warehouse store, was brought in to replace the Wieboldt’s location. Instead of revitalizing the core of the mall, Menards decided to close their mall entrance within a couple years, effectively rescinding any promise to revitalize the decaying interior of the mall. Way to go, Menards. In 1996, the mall’s 60-plus stores had been pared down to only about two dozen, and management decided to unload the mall on a new owner, who embarked on radical new renovation plans. 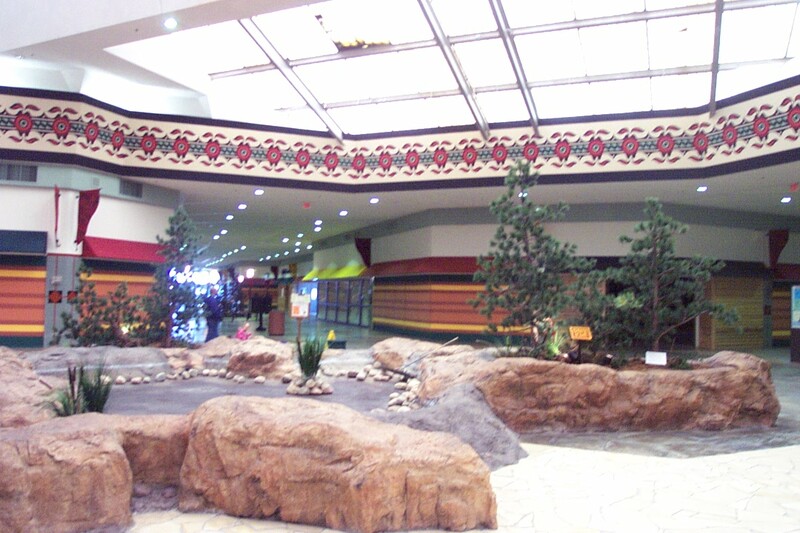 The mall was given a woodland decor, and renamed Wilderness Mall. 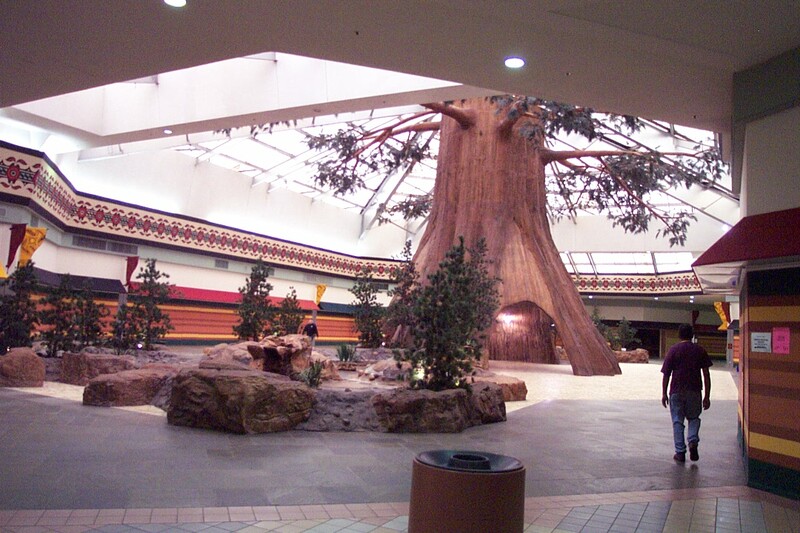 With the renovation came several indoor changes, includng a ridiculously large fake tree placed in center court – a tree so large you could walk through it. See the pictures for a better explanation of this. 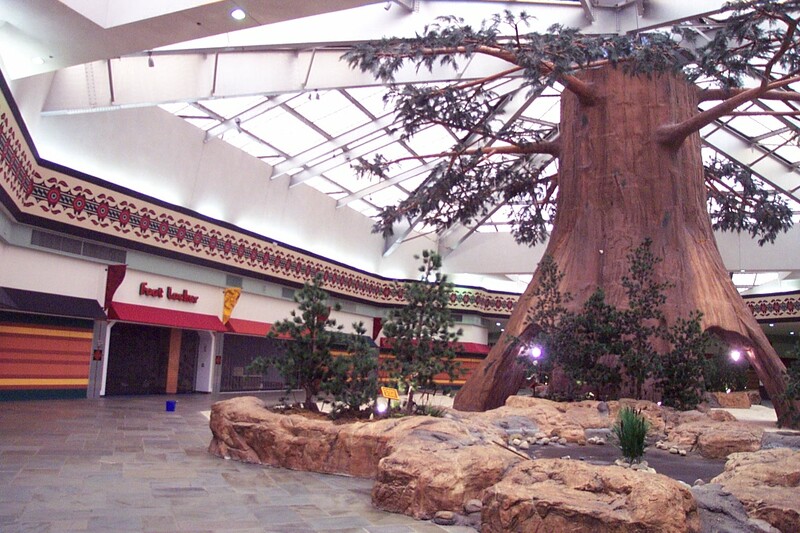 Sadly, the bandshell and kiosk area which formerly occupied center court were replaced by this ‘tree’ and other faux-woodland things, like fake branches and fake pine trees. I’m not ever sure how ‘up north’ corresponded to Joliet, but here it was, for better or worse. Unfortunately, the ‘worse’ began to be what materialized following the woodsy renovation. Only the Secretary of State (Read: DMV) decided to relocate into the cavernous dead mall, and things just got worse and worse. The cinema began to run discount movies, and when Woolworths closed in 1997 the entire east wing was sealed off – for good. Then, when Montgomery Ward closed in 2001, the mall began life support as only a few services and the Off-Track Betting parlor were located inside. For some reason, one of the last “real” tenants of the mall was a Foot Locker near center court. I remember a visit there in 2001 or 2002, and the Foot Locker was the lone tenant at center court. The employees were nearly asleep sitting on the bench waiting for customers, and it seemed like the store was all but forgotten. Other favorite stores included a western wear store and a store called “Scrunchie Heaven” – imagine what they could have sold! There was also a travel agent, and most of the stores were located either around the north (main) entrance where the OTB was, or the south entrance where the cinema and Secretary of State was. Once Wards closed, the mall was actually sold to Menard Properties, and only a few more years passed before Menards unveiled plans to raze the mall, build a Menards Supercenter, and lease the other half of the site to Wal Mart so they could build their own Supercenter. And so it was done. 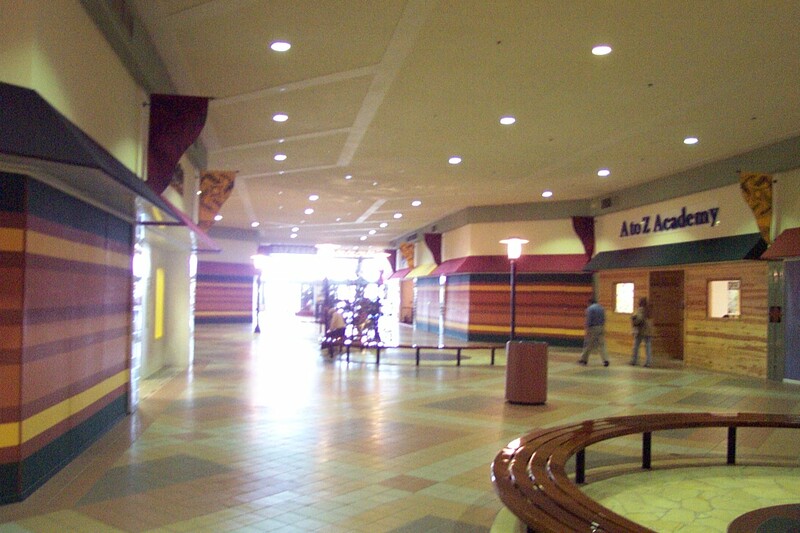 What was left inside the mall (The OTB and the Secretary of State) were moved to outlots, and construction began on razing the mall in 2004. Today, both Wal-Mart Supercenter and Menards Superstore sit side-by-side on the site formerly occupied by the mall. Hooray? I wonder what became of the ‘tree’ and the rest of the ridiculous wilderness-themed tomfoolery? Did it just go in the trash heap, or was it somehow recycled for more people to enjoy? The pictures featured here were mostly taken in 2002, with the razing pictures taking place in 2004. Enjoy them and leave your comments as usual. What a bizarre place–a non sequitor tree on a tile floor. It’s a shame that it never acquired the iconic status of the “leaning tower” YMCA in the NW suburbs of Chicago. I swear, I’ve stepped into one of the many Indian gaming places in my state. The overall ‘wilderness’ design inside and out. Even has hints of ‘Native American’ designs trimming the building. Even has ‘off-track betting’ to boot. Ah yes, and that fake tree ‘is’ rather silly looking. What a waste of space. The design scheme works for the various casinos here, NOT this mall though. Map this mall’s address out, and it’s easy to see why it died quickly. Poor location…it’s nowhere near any ‘major’ highway. Having three major anchors that went belly-up (Wieboldt’s, Woolworth -and- Wards) within a 15-year bracket doesn’t help either, nor did Menards sealing their entrance. Weak anchors, overlapping chain representation (at this and Louis Joliet Mall), poor location, a lackluster economy (in the late 1970s/early 1980s, then again in the early ’90s). This place was doomed from the beginning. Still it’s too bad. I’d bet this was a rather lively place back in its first few years. That’s the old Service Merchandise, right? @Jonah Norason, no—- service merchandise was at the old boston store in hillcrest shopping center, then moved over where the burlington coat factory is at now. No, Service was at Hillcrest, which is essentially up the street on Larkin Avenue and was Joliet’s first major shopping center. I really do miss this one; it was a great find back in the day. Well……I can’t really find fault with that. Guess all of the stores made like a tree and leafed. 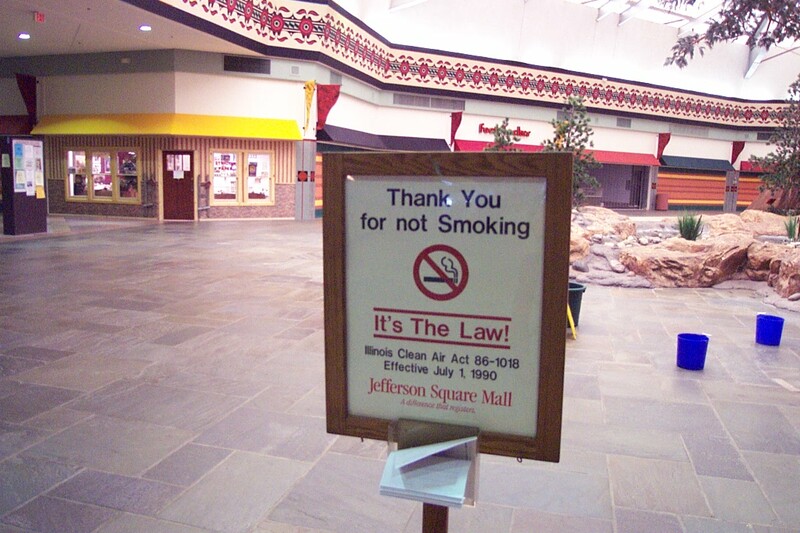 Jefferson Square Mall (I refuse to recognize the incompetence that was Wilderness), had a very long, sad history. I was born in 1986, right before the decline. I remember shopping in Wieboldts before they closed. About every week, from the time I was old enough to walk to around the time I was 5, my dad and I would go to the Big Brothers Big Sisters miniature golf place. This was still back when the wings had in-ground seating garden bench things. Ironically, I work for the Menards built on top of the ruins of Montgomery Wards. Although the tree was a cool idea, it looks too big for the space. This was one of my local malls. I remember it being a big draw in its heyday (1975-1987) while Wieboldt’s was there. The decline started after Wieboldt’s left as Ward’s could not hold the mall on its own (Ward’s was in enough trouble as it was). Many of the stores were the same as in Louis Joliet: Waldenbooks, Printer’s Ink, Circus World Toys, Stuart’s, Musicland, and many more. It did, however, have stores unique to it: Roger’s and Holland’s, Lerner, Memory Lane (a gift type shop), Richman Brothers, and Woolworth’s, as well as the anchors. Jefferson Square was originally supposed to have Carson Pirie Scott as the thrid anchor, but they backed out before the mall was designed and built. Jonah, that picture is not a Service Mechandise (which was in Hillcrest from about 1979 to 1986 and then in North Ridge Plaza from 1986 till the chain went out of business). It is the former Lazy 8 Western Wear shop, which was originally a Hickory Farms of Ohio. When opened until the Wilderness conversion, the mall boasted sunken seating areas in the corridors, a bandshell at the NE end of the central court with a water feature around it, and a four store kiosk at the other end of the central court (mirroring the bandshell). The floor tile was parque laid diagonally in patterns that matched those on the ceiling. The ceiling was painted white with beams painted orange diagonally across them. The tile in the courts was a rough cobble-like surface of dark gray stones cut into squares and rectangles. The courts also had translucent glass above them, casting a yellowish light into the courts. There were also only 2 entrances other than the 2 anchors – at the ends of the north and south corridors leading from the central court. In one of those corridors, there was a very seventies abstract sculpture (I think it was down by That Game Place and the Cinema I II III). Chip, I remember that day all too well. That tree looks so cool! It’s so unique, it’s something I wouldn’t expect that to be in a mall, I wonder what it was used for decoration? a cover for a playground type area? I hoped they saved it somewhere. 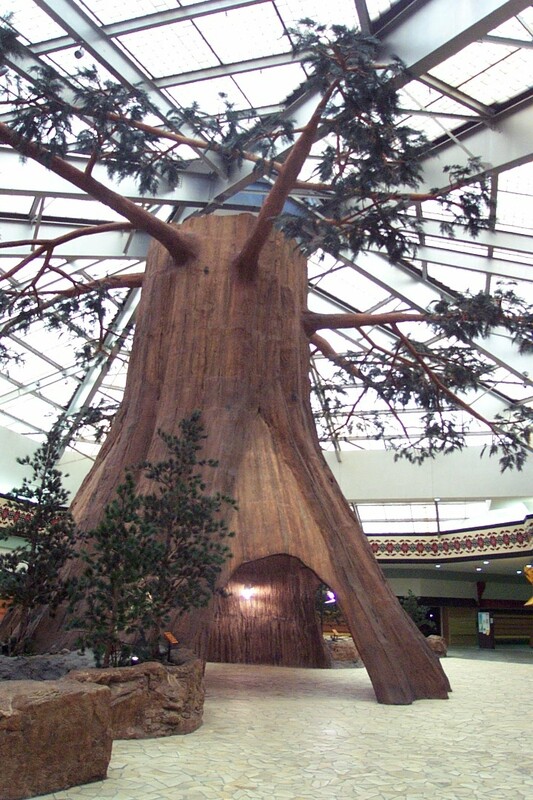 Wow, this mall is truly unique in it’s later (wilderness) decor. Too bad it didn’t survive. I’m just amazed at how much some of you remember! With that in mind, anyone remember the Woolworth’s eatery? How about the soap opera stars that came to visit it? I still have a collection of my pictures with Santa and the Easter Bunny at Jefferson Square. I remember laughing with my sister about the Wilderness Mall being named that because the mall resembled the wilderness being so empty. Anyone have pics of the old 70s decor? Nothing like this Wilderness tree stuff in there. @Sarah, I grew up in the College Park neighborhood a few blocks away in the 80s. I witnessed the highs of the mall: huge baseball card, comic book and craft shows. I do remember Jeremy and Dixie from All My Children visiting the mall. It was jam packed with housewives and me, my brother and dad taking pictures because my mom had to work (at Bergner’s in Louis Joliet Mall not coincidentally). My favorite store in the place was a stinky, smokey old baseball card and coin store by one of the far mall entrances. I still remember my mother’s Christmas Story joy of winning a sled full of Christmas supplies from the Printer’s Ink store. I bought all my childhood Beverly Cleary books at the Waldenbooks. I still haven’t found pizza with that weird Orange Bowl sauce. I remember the smell of the Woolworth’s eatery distinctly, but my mother never let us eat there. My memory of Woolworth’s was that the sold cassette tapes,but they were in this cabinet with slanted glass and circle cut out of it just large enough for you to not stick you hand in. Basically, the cabinet taunted you for not being able to touch the cassettes until you got someone to help. I got some of the worst haircuts of my life from the Regis hair stylist at this mall, until she moved to the Louis Joliet Mall and I got terrible haircuts from her there. I remember being vaguely creeped out by the mirrored entrance to Deb. I remember the floor plan of the 80s Montgomery Wards and never learned the 90s remodel. 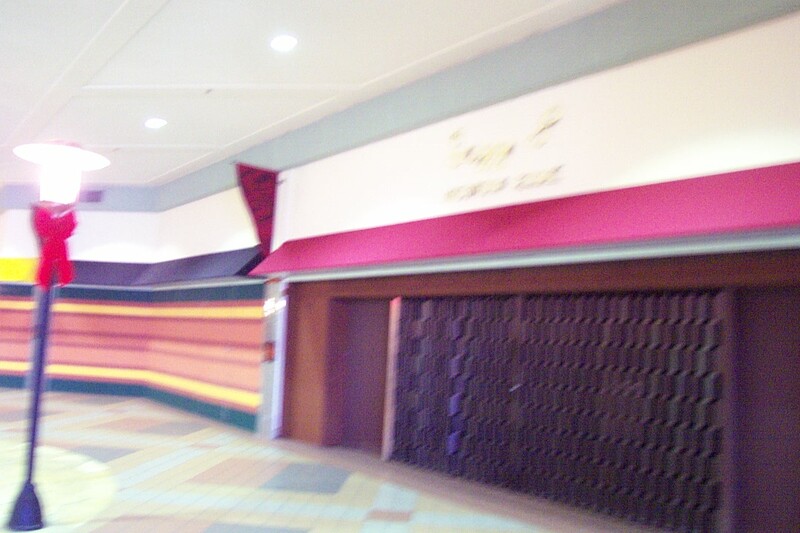 And I still have weird empty mall dreams that I think come from visiting this mall years later after its decline. Not sure how many people know this, but I just found about it recently, Woolworth’s IS Foot Locker! Foot Locker started as a chain owned by Woolworth’s, and eventually became the only part of the company to make a profit, so they closed down all the Woolworth’s, and kept Foot Locker going. Some of the old Woolworth’s were changed into Foot Lockers, including a historic one here on Broadway in Downtown Los Angeles. It’s still going as a Foot Locker, having opened as a Woolworth’s in 1928. Woolworths owned many shoe stores in its final years. Kinney, Foot Locker, Athlete’s Foot, Champs Sports, Finish Line were a few under Woolworth’s umbrella. I briefly worked at Frugal Frank’s at Yorktown Mall in Lombard IL in 1995, which Woolworth used to clear out old Kinney shoes. ( I think a Frugal Frank’s existed in a New York mall at the same time.) Many of the first Foot Locker’s were always near a Woolworths. Oh my, I didn’t expect to stumble on this! I lived right across the railroad tracks (on Marmion) from 82′ to 91′. I actually delivered the Herald Newspaper there for a couple of years. I remember: being let in an hour early to drop off papers, getting free drinks at the Orange Julius, getting free games at That Game Place, and seeing movies for free. I can remember when Menards came in. My friends and I got chased off more than a couple of times for riding our bikes over their mulch and dirt hills. I eventually got a job there but later quit because I was moving away, out of state. I just returned to Joliet a couple of months ago. Wow. Joliet’s not the same and it’s a shame I never saw the Wilderness phase of “the square”. Wow! What memories this has brought back! My very first job at age 16 (in 1980) was at Bresler’s Ice Cream. It was right between Fannie May and The Bottom Half on the corridor leading to Wards. I remember that parque floor, but hadn’t thought about that sunken seating for years! I had a friend who worked in one of the center kiosk stores – Childrens Photographers. I think there was a Flower Island in there as well. Sarah, I remember the Woolworth’s eatery. They had the BEST french fries! A couple years later, I skipped many a class at Joliet Junior College to go play Space Invaders and Astroids at That Game Place. I never knew about that whole awful Wilderness thing! I moved to Florida in 1982 and didn’t go back much after that. I’m kinda glad. I have my memories of the place before the weirdness set in! Such a big part of my teen years was that mall. we lived in the Parkview subdivision behind Burger King in the early 80’s, my kids and I spent a lot of time in that mall. 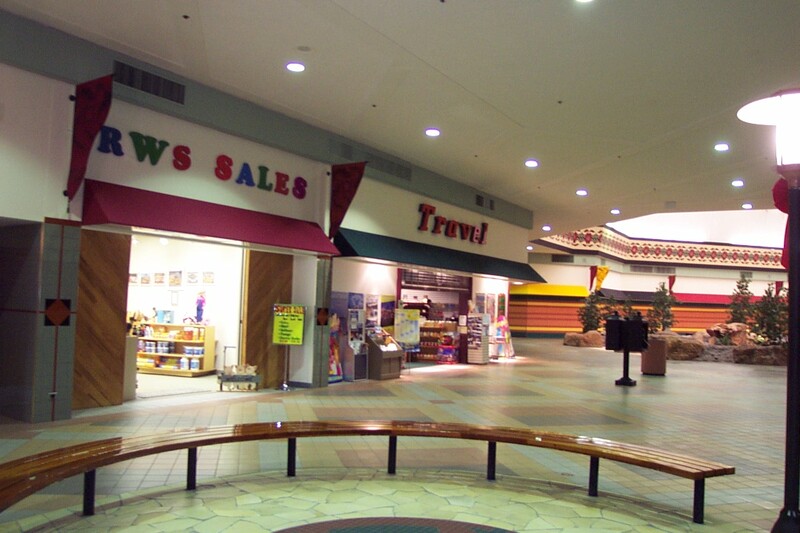 Does anyone have pictures of the inside of the mall during the 80’s? This is such an incredible blast from the past. Reading this and all of the comments has brought back so many memories. I had one of my favorite childhood pictures taken at the Photo Kiosk which was owned by Sears. I met one of my favorite Soap Opera stars at OTB. My sister worked at Weibolts. I saw my first movie at a theater in this mall. Debs was my favorite clothing store. I can remember walking through Woolworths begging my Mother for everything I could see. My nephews had birthday parties at the miniature golf place. My first bedroom set came from Wards. I sat in the sunken seating and ate ice cream. And if I close my eyes and imagine hard enough, I can still taste the pizza and Orange Julios’. Thank you for the wonderful trip down memory lane today. I work at D’Arcy Motors (formerly Vidmar) right across the street from the former mall, and now the Mernards/Walmart Megacomplex. I also remember going to the mall when I was a kid. I remember the neat little fountain that they had that my grandmother would give us pennies to throw in. I watched the mall decline, and remember when the last nail hit the coffin with Montgomery Ward announcing the out of business sale. It was actually a cool looking store on the outside, with neat diamond shaped white pillars-on the main building itself and its little auto repair portion on the NW corner of the lot, which is now a Starbucks. By the way, the huge tree in the middle tried to have a happy ending. They were offering it for sale for $1.00. All you had to do was remove it. This thing was massive (as you could see from the pictures) and all the schools, etc that wanted it could not afford the shipping, which invariably involved some logistical nightmare. It sat, resolute under the elements after they removed the roof covering it. After no-one could be persuaded to take it, it was taken apart and scrapped like the rest of the metal in the superstructure. They even had signs posted to warn off people that wanted to come take the junk to sell. The only thing that remains the same on that lot is the Chase Back in the northern center. Sad to see it go. In the late 80’s, Jefferson Square had a teen “juice bar” called The Club, with punk nights and live bands. Many of well know bands played there. I saw Ministry in ’89 there (yes, in a dead mall) . My band played once too. I spent a LOT OF TIME in the late 80’s, early 90’s at this place. Besides the shopping, I spent my time at the 2 clubs they had during these years there. They were great! There has not been anything remotely close to these 2 place in Joliet since! First, there was The Club which was a “teen juice bar”, but they had great bands there! I saw Ministry, My Life With The Thrill Kill Kult, and Sonic Youth!!!! You won’t see anything like that in Joliet now. Then, after that closed down, came Bermuda Bobs!!! My friends and I loved that place! The surfboard shots were the best!!!! I think I was in every bikini contest they had which was sooo fun! I had soo much fun when I danced in their shadowbox upstairs! The dance floor was big and roomey. The whole place was really. No matter how many people there seemed to be you never felt like you couldn’t breath like most places now. (And we only got kicked out a couple times for my drunken behavior….lol) Anyway we had really GOOD TIMES at that old mall, my best friend and I will never forget them!!!! I loved reading the comments and it brought back a lot of memories for me, too. Does anyone remember the great Haunted Houses that the Jaycees used to host every year in the Wieboldt’s wing? I took “the Pepsi challenge” in the Center Court. As a kid you got almost get a free meal by trying all the samples of food at Hickory Farms. I also remember looking in awe a store window (called Hardee’s shoes, maybe?) at giant platform shoes with goldfish swimming in the heels. Now that is some 70’s memorabilia! About the TREE. I remember reading the the Herald News at the time that Jefferson Square was bought by a group of Japanese investors. They actually comissioned a firm who worked for Disney to build that tree. One of the investors said in the new (Wilderness) mall, that families could come visit the mall and picnic under the tree — I knew then that there was no saving the mall with that approach. Not sure why they never tried to reinvent the place as an outlet mall. Jefferson Square was the perfect hangout for a kid who lived close by in Parkview subdision and in retrospect was really a nice mall. I used to work in a store called Shirt Tales when I was a teenager (bright yellow storefront!). Thanks for the memories! 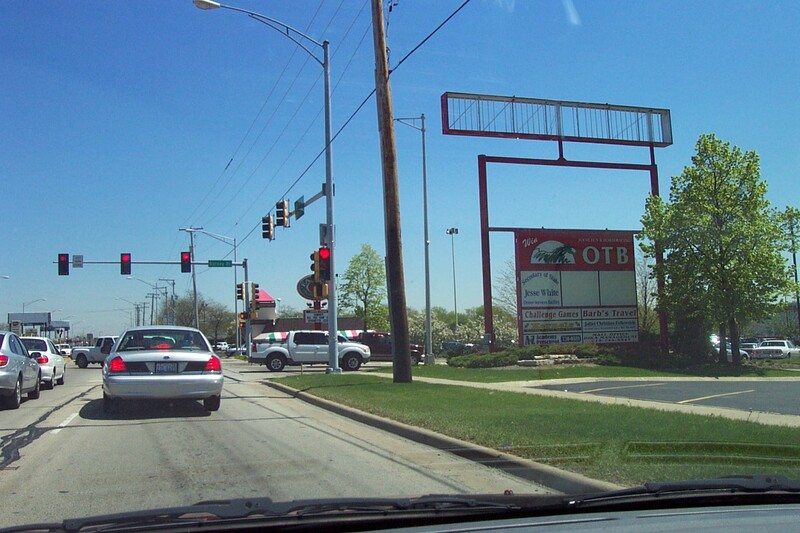 Does anone know of some sites about Old Chicago in Bolingbrook? @Rick, the Wikipedia page for Old Chicago has some links. The Labelscar site map lists both Jefferson Square and Wilderness Mall as if they were two separate entities. @Jonah Norason, This are a couple of Facebook groups for Old Chicago. Wikipedia has been the best source so far. Even harder is finding information on South Commons Mall, which sat across the street from Old Chicago. This is what got me interested in the whole dead mall thing. I remeber going to the DMV here in 2002 and was totally intriqued by a totally desolate empty mall. I went into the old movie theatre which th gate was open and it was totally eeire! Its too bad it is all gone now but the whole woodland decor was stupid and the tree was ridiculous but that was better than the crap being built now. I wish I had pictures now but didnt think of it then. RIP and thanks for the memories. 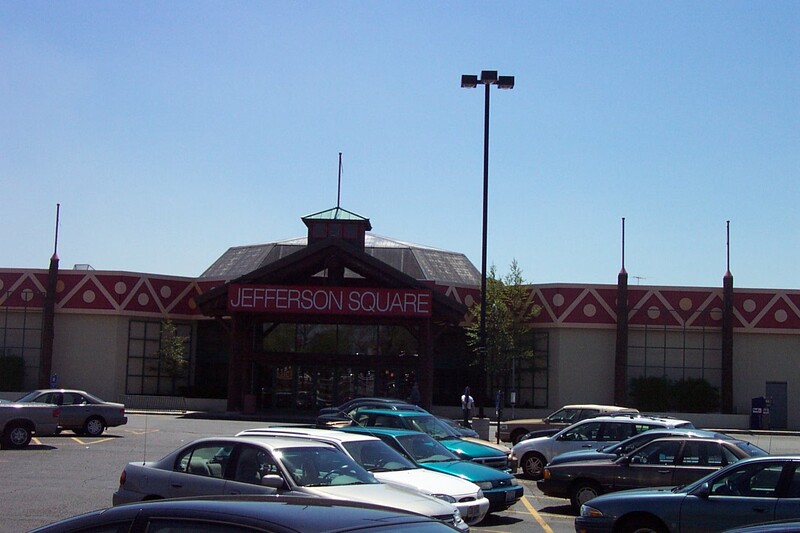 Growing up in Joliet during the ’80s, I have a lot of memories about Jefferson Square Mall. Reading stuff like this brings them all flooding back. When my friends and I would go there, we usually ended up hanging out in the wing by the theater. Conveniently, that wing also housed That Game Place and (if I remember correctly) the mini-golf course. That Game Place was where I first played Konami’s Simpsons arcade game. A friend and I also worked our way to the final boss of Williams’ NARC at that arcade, and we drew quite a crowd for our efforts. Unfortunately, the final boss was incredibly difficult to beat. Our quarters were running low and the movie we were at the mall to see was about to start, so we had to abandon our game. Even though we didn’t beat the game, we had about a dozen people applauding us for getting as far as we did. I can’t remember what movie we were there to see, but I’m pretty sure that final movie that I ever saw at JSM was Batman: Mask of the Phantasm. I also have vague, scattered memories of being dragged to Woolworth’s by my parents and begging to go look at the Star Wars figures in the toy department. I also would look in awe at the selection of Atari 2600 games at Wards while my parents shopped for appliances. There was also a pet store in the mall (next door to Waldenbooks, I believe) that always had an ample supply of puppies and kittens to fawn over. Then there was The Orange Bowl. The best place to eat in the mall. Granted, they only served junk like your typical concession stand pizza, but they also served the Oh Joy. A sort of slushy, orange concoction that was dolloped in a cup for you to eat. Not quite a Slurpee; not quite sherbet…it was something in the middle. There was also the Snow Joy variant (my favorite), which had layers of Oh Joy blended with soft serve vanilla ice cream. Delicious. A gang-related shooting in (again, if I recall correctly) the early 90s didn’t do much for Jefferson Square’s reputation around town. A lot of parents were suddenly very wary about letting their kids go hang out there. Still…great memories. I don’t think I ever stepped foot in the place after the Wilderness makeover. I kinda wish I had now, if only to say that I had seen it firsthand. I remember when you could still buy a Lawn Boy 2 cycle that made a cloud of blue smoke. 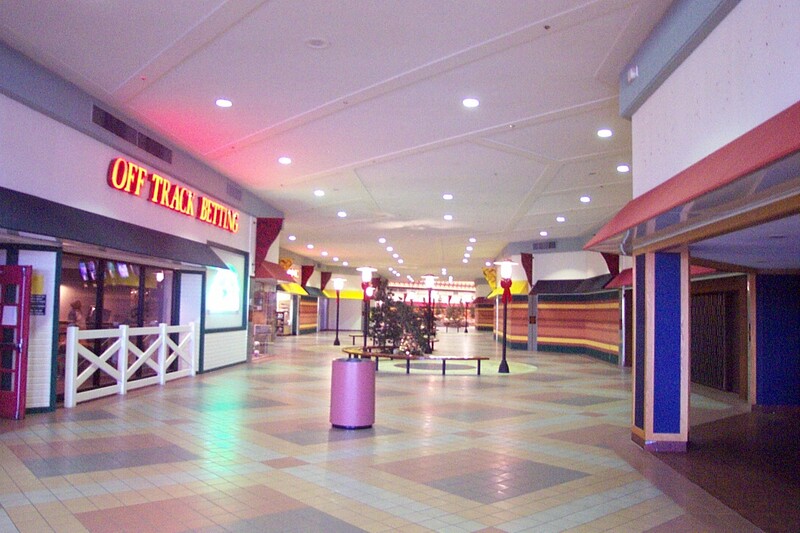 I grew up going to Jefferson Square Mall. We would always park at the south end and go in the entrance by General Cinema. I remember trying to sneak into American Gigolo there and getting kicked out for being underage. Across from the theater was the mini-golf place which later became a bar. I remember a store called O’Matto’s that carried cookware. I think there was a Payless in this wing at one point. Farther down was Record Town. I remember buying an Abba 45 there. I think it was Fernando. In the middle was the sunken seating. I remember there were kind of reddish velvety cushions and some kind of wooden geometric setup. The soap stars were from All My Children – one was Taylor Miller. To the west/southwest was the wing that ended in Montgomery Wards. The Debs was down that way. I think Lerner’s too.To the east/northeast was the wing that ended in Wieboldt’s. I remember the shoes with the goldfish in the clear heels! Very Pinball Wizard. In this wing were also a couple of women’s clothing shops – I think it was Brooks and Casual Corner. There was a Paul Harris and another store where they did mannequin modeling on weekends.There was another wing to the nothwest that housed the Orange Julius. Yum! There was a Merle Norman, Radio Shack, County Seat, Hickory Farms, later on the Western Wear store. This was a very fun mall in the late 70’s/early eighties. @terri, Oh man, I forgot about the County Seat that was actually country themed. In the later years, County Seat stores looked like every other store, but in the late 70s, early 80s it has swinging saloon doors, wood shingles and a weird smell. I remember going to Jefferson Square Mall quite often as a child and teen. In fact, I was invited to hoist a flag at the mall’s grand openning. I think my mom still has a picture of it from the local newspaper. Anyway, there was a “Cinema 1, 2 3” movie theatre there that was great fun back in the days before the 15- 20 screen theatres of today. The cinema eventually closed, but was re-openned as a second-run “cheap seats” theatre for a while. That end of the mall also had “Stamps Coins, & Shells” store. I spent a fair amount of my money there in the early-mid 80’s building my stamp collection. The mini-golf place (Putter’s Paradise” was quite a bit rundown, but it was a great place to spend rainy afternoons since it was indoors. It was eventually re-openned for a while with the profits going to Big Brothers/Big Sisters. I got my first paying job by volunteering for them. They eventually hired me to cover 20 hours per week. There was a pizza place, video game arcade, Printer’s Ink, and a pet store down at this end as well. I also remember “The Club” (which someone else posted about). No anchor store on this wing. A second wing hadMontgomery Wards, Debs, and another female clothing shop. This wing also had a Spencer’s Gifts, Walgreens, Walgreens Diner, a men’s suit store, and a Circus Toy store (Which seemed to have the most trouble once KayBee’s openned elsewhere). The center of the mall had a bandshell, a raised platform, plus a wishing well water feature. Several shoe stores (Kinny’s, Foot Locker etc) and women’s clothing stores. Weibolt’s and Woolworths were 2 of the larger stores in this mall. The Orange Bowl had great pizza. The Off-track betting place brought many people to the mall for a while. Unfortunately most of their customers seemed to STAY in there and not shop the rest of the mall. Rick- I remember the haunted houses fondly. The Jaycee’s ran it first. It was then sold to United Cerebal Palsy Center (UCP), and then finally Big Brother’s/Big Sisters. I lost my voice volunteering as random characters in the haunted house under both UCP AND Big Brothers/Big Sisters. Big Brothers/ Big Sisters also had a Christmas themed house there as well. Patrons were guided through by volunteers who told a Christmas themed story that was acted out in the various rooms. I remember the DMV being here as well. I think it was an attempt to get more people coming to the mall, but by this time there were hardly any stores open anyway. 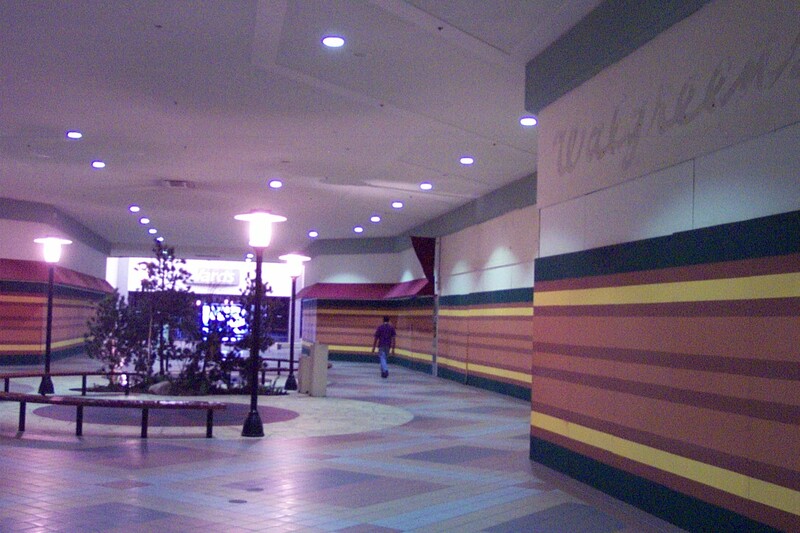 The Wldness theme was another attept to re-invent the mall, but by this time Louis Joliet, Hillcrest, and other malls and individual stores had taken over. Rent was too high at Jefferson Square for shop owners to stay open, much less compete – especially with few/no large anchor stores left. One of the big troubles for this mall was that it eventually got a reputation as a gang hangout (whether the reputation was true or not). I remember going to the mall with my Grandparents in the early 80’s. There was a buffet style restaraunt called DUFF’s…. Does anyone remember this place? I believe it was where the Off Track Betting Parlor later came to occupy. I also remember Toy Circus. But from reading the comments I didn’t see any recollections of DUFF’s…. The food there was AWESOME!!!! @Barry, Yes, I remember Duff’s! That was my first exposure to the concept of eating until you are sick “to get your money’s worth.” Does anyone remember JR’s Music World next door? I remember talking my mom into buying Phil Collins’ second cassette there. I remember their walls of cassettes seemed endless when I was 10. I grew up in Lockport during the 90’s, and remember trips to this mall with my older brother. I remember the empty wooden interiors, as well as discovering what an Orange Julius was. On a more interesting note, I remember right before they tore the mall down, Menards was using some of the inside of the mall as store space, at least for clearance items. Does anyone else remember this? I grew up on Richmond street just a few blocks from the mall. I do remember them having the best arcade and I could pick up white fence farm chicken on the way home. Only fitting that Menard’s would survive. Growing up in the area during the 60’s, their was a lumber yard there before the mall was built. Then the rest farmland from Jefferson to McDonough and Joyce to Inwood before Caterpillar Dr. was paved. I grew up in the 80’s (81-89) and this was the Rockdale boys hangout as a kid. We would go there anytime we had some money in our pockets. That Game Place was the place to be on the south-side of the mall. A few years ago, I finally found a ton of the games they had on cd through E-Bay. Super Mario, Super Sprint, Asteroids, you name it. The coolest game place ever. Orange Bowl pizza was cheap and great. Musicland, just a few steps away. We ate a Duff’s many a times also. 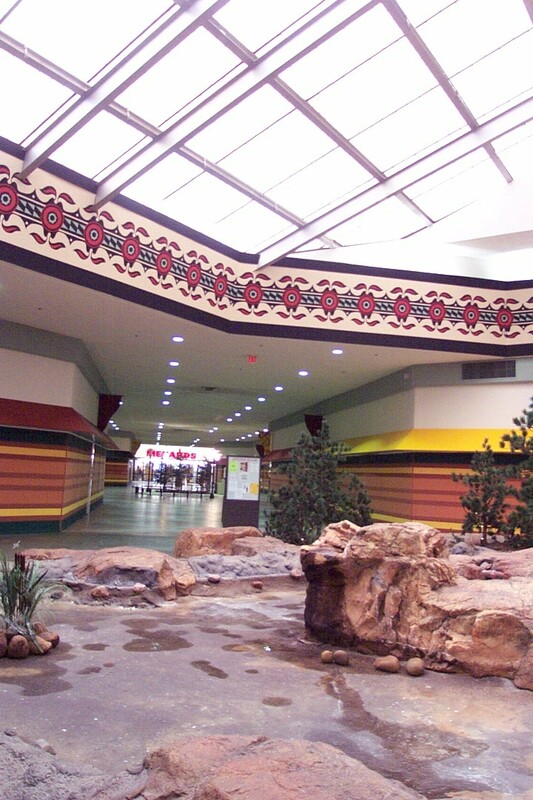 I can tell you I truly miss Jefferson Mall as it was in the 80’s and when I visited it as Wilderness, that’s when the reality hit. It was only a matter of time before the big KABOOM. Now, I shop at Menards and Wal-Mart. On the same ground I used to walk as a kid and a teenager. 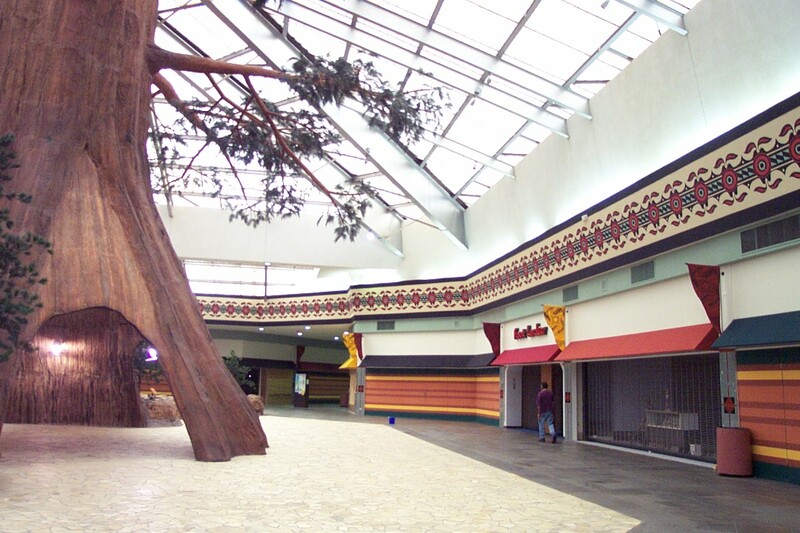 If anyone has pics of the inside of the mall during it’s heyday, please post. I was just looking for old photos of JSM and stumbled upon this site. After reading acouple of comments I have to put in my two cents. I was born in ’82 and grew up in the park view subdivison across the street. The only memories I have are the ones from shopping with my parents. I really remember Orange Julius and Lazy 8 western store which I havent seen any one post of. I also remember the wal greens, music store, foot locker, jewelery store, the ghetto cloths store by foot locker, sthe sports store, arcade, OCB, mini golf, and “monkey wards”! I’ll never forget those suken sitting areas either. Does any one remember when they had the haunted house at the mall? I remember going once but dont really remember where it was located. BTW I think that the Wilderness Mall was a dumb waste of time and money. Does anyone remember the carousel ride was in the middle of the mall? I think that happened before the tree. I have some great memories of that place and so does my wife who also grew up in joliet. Its a damn shame that it got destroyed. If anyone does have any retro photos please post a link. I remeber going to JSM everytime that I went to Joliet, and I remeber that old carousel. I remeber them having it back in the 80’s, but when the 90’s came along I don’t ever remeber it being there anymore. I used to go there alot to the movies and seen many a movies there. Did this mall used to have a carousel around 1990 – 95? I remember the big steel pyramid thing hang above the fountain always scared to go under it as a kid because I thought it would fall. Note that even Foot Locker closed before the ax fell. 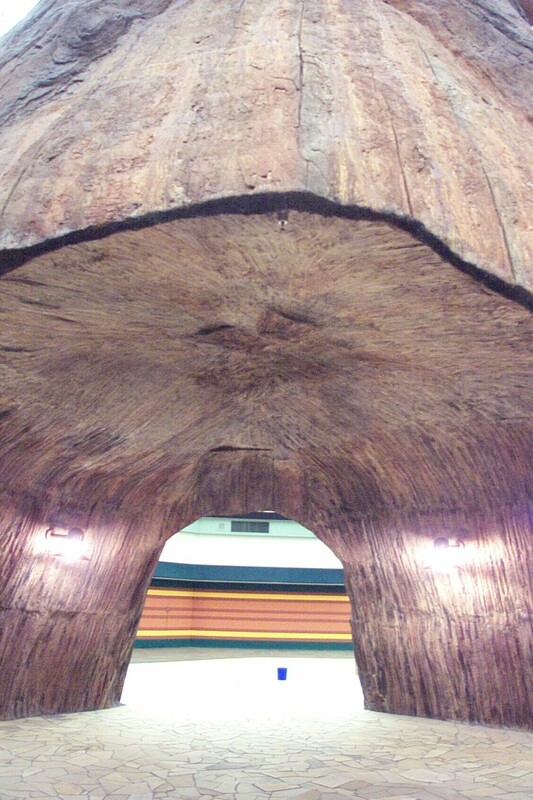 The roof leaked pretty bad, as attested by the buckets seen in the center court by the “tree”. The Walgreens was still open for business when this place was re-christened “Wilderness Mall”. I recall peering into the vacant space after they moved out ca. 2001. Too bad there were no photos of General Nutrition Center (GNC) included. They *DID* remain until the mall proper was sealed up in September 2003. Only remaining businesses then were the DMV & OTB. Anyone else recall that there was a church in the Wards wing in the last few years? I have awesome memories of this mall. Remember the large stylistic “JS” logos which were used to cover up the few remaining vacant stores in the mall’s early years. I remember being awestruck by the large lighted mall directories–it was the first mall I had ever seen. The parquet floors had many hollow spots by the time the mall was renovated in the 90’s. That was also when the cool sunken rest areas were filled in and replaced with those ugly circular benches. Oh–one other vestige of JS remains–a small structure near the north entrance on Jefferson. It is made out of the same pre-fab concrete as the mall exterior. It must function as some sort of a utility shed. Thanks for posting those photos! I was on the work crew (Larson Company) who laid up tons of epoxy and applied bark texture and paint back in Oct./Nov. 1996. (It was strange living in a hotel in Joliet, IL for a few weeks.) I was wondering what happened to that tree. Now I know, thanks to Jimmy K.